For one week, Citizens Bank Park was turned into a Winter Wonderland filled with hockey action. The action featured Philadelphia hockey in it’s most beautiful and elegant form, which was in front of 45,000-plus diehard Flyers fans for the whole world to see. The past week was the fifth annual NHL Bridgestone Winter Classic. For the third time it was held in the confines of a true American landmark: a ball park. After Chicago’s Wrigley Field and Boston’s Fenway Park, Citizens Bank Park played host to the growing winter sensation the NHL created with the Heritage Classic in Canada almost a decado ago. The fantastic week of hockey, which we will recap with a little help from “The Checking Line – Flyers Edition“, began on New Years Eve and concluded this past Friday, January 6. To start the festivities, former players of the New York Rangers and Flyers met in a once-in-a-lifetime game for fans young and old. Whether the people in attendance were 15 or 50, they got to see Flyers greats Bobby Clark and Eric Lindros share the ice for the first time while seeing Bernie Parent lace up the pillows for one final time in front of a roaring Philadelphia crowd. In the Alumni Game, Parent started and played for about five minutes before giving way to 80’s goaltender Mark Laforest and early 2000’s Phantom Neil Little, which inspired myself to write a piece on the Flyers goaltending history for the past decade. The two held the Rangers alumni to just one goal, a tally from Hall of Famer Mark Messier, in the 3-1 win in favor of Philadelphia. The Flyers Alumni struck first, with the most dynamic duo in Flyers history connecting on the goal. It was John LeClair who found Lindros to give the Flyers a quick 1-0 lead. Also scoring for the Flyers were Shjon Podein and recently elected Hall of Famer Mark Howe. Two days later, the current squads from New York and Philly collided in one of the most exciting Winter Classic battles to date. The Flyers held a commanding 2-0 lead fueled by Brayden Schenn’s first career goal and Claude Giroux’s but collapsed in the third to lose 3-2. Led my Michael Rupp’s two goals, the Rangers came out of the week with two points in the standings and the most important win of the week. The city wasn’t done using the ice as they hosted several high school and college battles, including the featured match up of the week between Neuman College and Penn State University. Lastly, Friday played host to the largest AHL attendance in league history when the Hershey Bears (Washington Capitals AHL affiliate) and Adirondack Phantoms (Flyers) squared off in the AHL Outdoor Classic. I had the opportunity to cover the AHL event for TCL, capping off an incredible week in hockey. Hershey and Adirondack played a tug-of-war game throughout. With the Bears holding a 3-2 lead, Adirondack’s Ben Holmstrom tied the game up with 20 seconds left in regulation. With all the momentum in Adirondack’s favor since the end of the first period, Shane Harper capitalized on a pass from Eric Wellwood to score the game-winning goal on Bears netminder Braden Holtby less than a minute into overtime to win it for the Phantoms, 4-3. 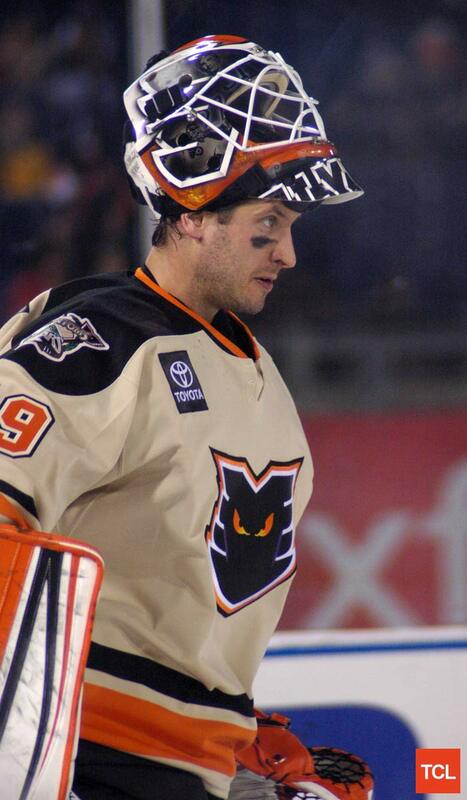 Lost in the exciting game was the return of Phantoms goalie Michael Leighton to Philadelphia. Leighton was the 2010 Stanley Cup playoff hero and goat for the Flyers, leading them to a historic come back against the Bruins before giving up the game-winning goal to Chicago’s Patrick Kane in the Finals. I had the opportunity to talk to Leighton after the game as well as recap his roller coaster career, including a stressful tenure in Philly. Lastly, TCL photographer Dan Gold joined me at the game and took an incredible amount of excellent photos from the AHL Outdoor Classic that are featured up on TCL’s site currently. The week of hockey at The Bank will be a week that the city of Philadelphia, especially the NHL’s most passionate hockey fans, will never forget.